This is War News Radio! Sooner than you might imagine, you can be one of the voices of War News Radio. Learn to report, interview sources around the globe, write for broadcast, produce radio and online content, and be part of one of the coolest and most important communities on campus. 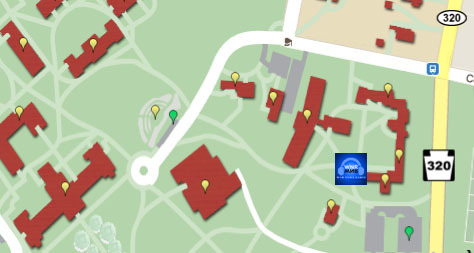 War News Radio meets on Monday nights at 9:00PM in Lodge 6, next to Bond Hall (See the map below). – Attend any weekly meeting, held Mondays at 9:00 pm in Lodge 6. – Contact Katherine Kwok at kkwok1@swarthmore.edu to join our staff mailing list. We’ll help you get keyed in to a role that suits your preferred time commitment and area of interest, and even teach you the necessary skills! Student journalists have been the lifeblood of the program since we began in 2005. Extended community: If you like our mission but don’t want to produce radio yourself, or even if you are not part of the Swarthmore community, you are always invited to propose new ways to collaborate. Please reach out to us via the contact information below. Thank you for taking the time to get acquainted with us.